You may have heard some hysterical stories about Easter, but let’s stick to the one involving a chocolate-loving rabbit. While mundane rabbits enjoy eating carrots, have you every wondered what sustains the Easter Bunny? How about a chocolate rabbit, you say? What? What kind of psycho rabbit would cannibalize itself by eating chocolate in the shape of its own species? Not one that I want hiding chicken embryos in colored shells around the yard, I’ll tell you that. Luckily, Swiss chocolatier Lindt has come to the famous rabbit’s rescue. The answer to what the Easter Bunny would eat is obvious once you think about it. Chocolate carrots – duh. 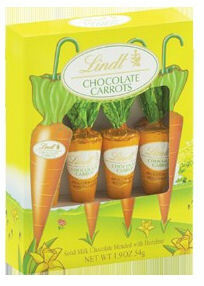 Now my question: are there carrots in this candy? Well… no. But it does have hazelnut paste. And each of the four chocolate candies are nicely wrapped to look like baby carrots (complete with stalks), plus little green curved handles that make the candy look like a vegetable umbrella. These handles are for holding your treat as you chomp away. So let’s hop like a bunny and try these fun-looking chocolates. I’ve unwrapped the foil and see a cone of good-looking milk chocolate molded to sit on top of a green plastic disc attached to the handle. I bite off the pointy tip and get some flavor going. Hey, this is pretty good. If you’ve had Lindt chocolate, you know it’s good. Not crazy good, in my opinion, but a notch or two above most mass-produced chocolates. Here, the milk chocolate is smoothly combined with a hazelnut paste. This flavor is fairly mild, but I like it. The chocolate’s not too sweet, and it’s got pretty decent mouthfeel. On the other hand, aside from the very nice hazelnut notes, the milk chocolate itself has a kind of one-dimensional flavor. For a quasi-novelty candy, these are much tastier than most. And yes, they certainly pass the cute test. But at $4 for only four little carrots (total weight 52g, 1.8 oz), you wouldn’t want to be a huge holiday rabbit looking for sustenance. Just gave these to a friend in a small basket as an early gift for Easter today and she was very pleased! Sometimes cuteness can make up for a little lack of WOW factor in flavor. i love lindt chocolate!!! it is my favourite.